Thank you for making this campaign a huge success! During the 2nd Lebanon war in 2006, HAS Advantage undertook an innovative campaign to allow people from all over the world to show their support, at no cost, for the brave soldiers of the Israel Defense Forces. Those who were touched by the news and wanted to connect with Israel, were invited to send messages or “hugs” to IDF soldiers on the front lines. 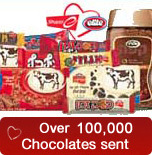 HAS Advantage collected these heartfelt letters, and together with Strauss-Elite, added chocolates for every message sent. Delivered to the front lines, these care packages showed our soldiers that they are not alone and we support them. 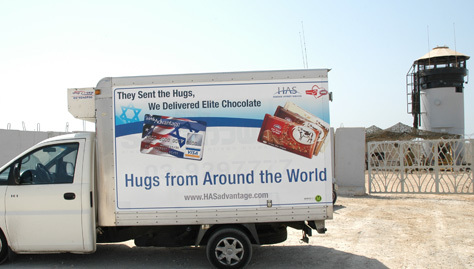 Representatives of HAS Advantage & Strauss-Elite traveled up north to visit with the soldiers and delivered over 100,000 “chocolate hugs”. My thoughts and prayers are with you as you bravely defend Israel’s freedom. New York and Israel share a special bond, and millions of New Yorkers stand with you and pray for peace for Israel and for the world. We deeply hope that the fighting will end soon, and that all the innocent people affected by this conflict will again be safe. On behalf of the City of New York, I extend my heartfelt hope that you will soon return to your family and loved ones. I send you my personal greetings and pray your mission will be successful so peace can return to Eretz Y'Israel. The story of Israel and the history of the Jewish people is a great one. It is marked by the heroism and valor of those who risk their lives so the enemies of Israel and Zionism will not prevail. As an American and a New Yorker, I saw on September 11th the horror and the destruction that terrorism can bring. In Israel, every day risks becoming a September 11th. I wish you well and hope you will have a speedy return to your families. From your extended Jewish family in the United States, I wish you Godspeed. Joshua Malina, Actor The "West Wing"
Kol hakavod to the men and women of the IDF. Thank you for your bravery and commitment in fighting for Israel's right to exist in peace. Click here to view pictures of your "hugs" being delivered to the front lines! "Like" us on Facebook to hear about updates, exclusive offers, participate in raffles and other opportunities.